Quick Summary : Adagio Teas is probably my favorite online tea shop. I have ordered several times through them in the past...and will almost certainly do so again. The pricing of Adagio Teas, considering the high quality leaves you get, is very competitive. By and large, they tend to undercut in prices most other quality loose-leaf tea retailers. I especially love how they have samplers for ALL their teas - not just a few of them. In my opinion, tea samplers are the only way to go for tea experimentation. 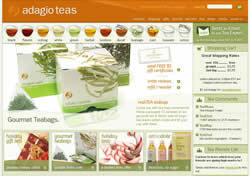 Adagio teas has a large but not overwhelming selection of teas. Still, one will only find a few other places online that have a larger selection of high quality of teas. Adagio teas uses excellent quality tea leaves. I've tried many teas from Adagio, and while I have not liked them all, I never can complain about the quality of the tea leaves itself. This is where Adagio really shines. They have, by far, the best merchant tea website on the Internet, period. Their website defines what a retailer of teas should look like. Ordering is quick and easy, too - with no awkward mouse clicks to buy things. The cart is quick and easy to use and they also provide "near 1-click" ordering once you have set up your account with them. For security purposes, they do require you to re-enter the security code of any credit card you use, even if the card is on file due to previous purchases. Another 5 star ranking here. Orders are completed quickly and shipped promptly. I've yet to have a single problem with any facet of an order with them, and judging by their Bizrate score, darn few people have many other problems either. One thing I love about Adagio is how fast their orders ship. It's a rare day indeed when you don't receive your order 5 business days after you place it. Adagio has free shipping on orders ranging from over $50 to over $75. At the time of this writing, orders over $50 shipped free, but this does seem to change depending on the season. If you live in a remote area, you will still be billed a "remote delivery surcharge," which is a charge FedEx recently started. And yes, places like Reno, NV (where I live) are considered remote places! Adagio Teas is one of my favorite tea shops to order through. They have a very large selection of high quality teas. Their website is beautiful, ordering is easy and shipments are fast. All said and done, I highly recommend Adagio Teas for anyone who wants to order some high-quality tea online.